Part One Visionaries, Hucksters, and Con Men: CEOs and the Games They Played One of the striking things about this most recent wave of corporate fraud and deception is how much of it was not centered on Wall Street, the traditional home of financial scandal. Of course, all of the fraud was in one way or another connected to Wall Street, as CEOs misled investors and rigged financial results in an attempt to keep their stock price high. But whereas the Street was the site of the great scandals of the 1920s and the 1980s, this most recent wave swept up not merely investment bankers and stock analysts but CEOs, CFOs, and vice presidents. And the companies that made headlines were not fly-by-night operations, either. Enron was the seventh-biggest company in the Fortune 500. WorldCom was one of the world's biggest telecom companies. Tyco was routinely compared to GE. And Qwest, after merging with US West, had become one of the country's most important phone companies. How did this happen? The pieces in this section, most of them compelling narratives about corporations sliding down the slippery slope toward fraud, go a long way toward answering that question. They give us CEOs, fed on a diet of hefty stock-option packages and hyped-up publicity, who came to drink their own Kool-Aid, imagining that they understood what no one else did, and that there were no obstacles to their visionary schemes. In many cases, it seems clear, executives did not start out intending to deceive. Instead, they made outrageous promises and then found themselves playing fast and loose with the rules in a desperate attempt to make those promises come true. Others, though, were more cynical about the process, using the hype machine to great effect and milking the system for all it was worth. Peter Behr and April Witt, for instance, paint a vivid picture of the way Jeff Skilling's attempt to turn Enron from a stodgy old utility into a high-powered, "asset-light" New Economy firm led the company into ever riskier behavior. Similarly, both David Staples and the team of Peter S. Goodman and Renae Merle link WorldCom's collapse to Bernie Ebbers' strategy of growth-through-acquisition. Ebbers was so focused on buying new companies that he never really figured out how to run the one he had already assembled. At Qwest, meanwhile, Joe Nacchio did an excellent job of spinning elaborate scenarios of a digital future-which his company would control-but as three writers for the Rocky Mountain News show, those scenarios never came close to becoming reality. Dennis Kozlowski, meanwhile, told investors that he wanted to make Tyco the next GE. But as Mark Maremont and Jerry Markon show, what he really wanted to do was make Tyco his own personal bank. Money manager David Dreman sums up the feelings of more than a few investors when he tells Maremont and Markon, "I'm a little dazed about how much money they siphoned off." What all of these pieces suggest is that at many companies, CEOs were simply convinced that the normal rules did not apply to them. David McClintick's narrative of Amyn Dahya's preposterous tenure as CEO of a small mining company called Casmyn Corp gives us a man who, as one board member put it, refused to take "any of the requirements of a public company seroiusly." Alex Prud'homme's profile of ImClone CEO Sam Waksal, who's been indicted for insider trading, reveals Waksal as a slick huckster more concerned with hype than reality. Marc Peyser's sharp analysis of the Martha Stewart-Waksal connection offers up a New York world in which personal connections and social networking count for too much. In "The Adelphia Story," Devin Leonard dissects the Rigas family, which came to regard Adelphia Communications, the cable company it ran, as its own private fiefdom. 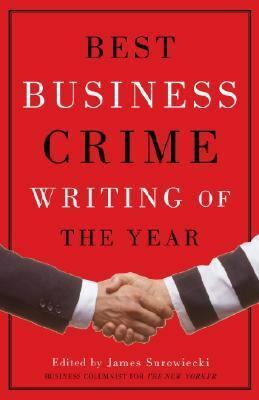 David Streitfeld's portrait of Critical Path CEO David Thatcher, who ended up pleading guilty to securities fraud, is an overpowSurowiecki, James is the author of 'Best Business Crime Writing of the Year' with ISBN 9781400033713 and ISBN 1400033713.